When I change the library from 3.0 to 3.1, result of PBRMaterial becomes dark. I tried changing the library version of PBRMaterial sample from 3.0 to 3.1. If the usage has changed, can you tell me how to fix it? There were a lot of fixes inserted in the PBR Material between 3.0 and until 3.2. Most of them have been introduced while developing our GLTF loader and trying to be closer to the other engines out. I would advise to directly migrate to 3.2 where we could check together the best migration strategy ? @Sebavan Thanks for the advice. 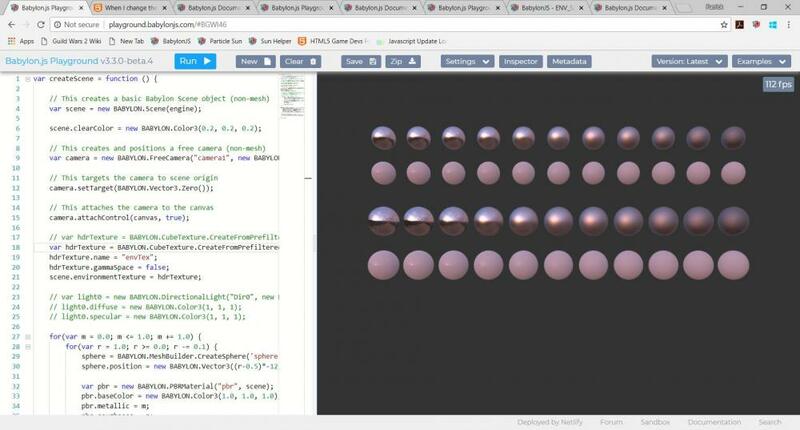 I tried PBR with Babylon.js v3.2 and v3.3, but it looks the same as v3.1. Also, I made a glTF model with the same result as PBR sample and compared Three.js and Babylon.js. The result of Babylon.js looks dark. The following is reference information. I tried to compare with several other libraries. Because each library gave different results, I did not know where the correct answer was. I am quite reinsured considering the amount of fixes that went in before 3.2 that it is now stable. Now, about the diff, it all depends how the lighting equations are in the different engines. I double checked and the shader has been changed quite dramatically since 3.0 explaining the visual difference we can see here (most of the fixes improved our interoperability with other engines). To look further into your scene, I recreated it with your code, while adding in the environment from the ground truth as well as our more neutral interior studio environment. I even turned off the directional light in your scene as you don't really need it anymore, at least not pointing directly at the spheres to light them. 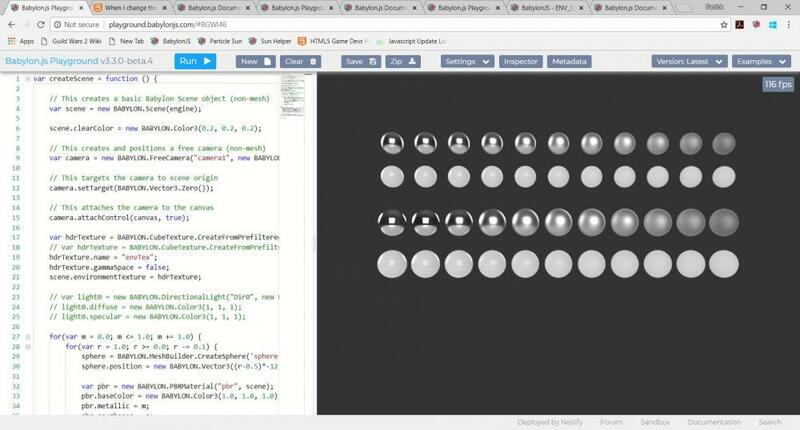 I also dropped in the glb of the test spheres from above in with your spheres with a slight modification to your spheres where we are only looking at two rows, one fully metallic and one fully dielectric. 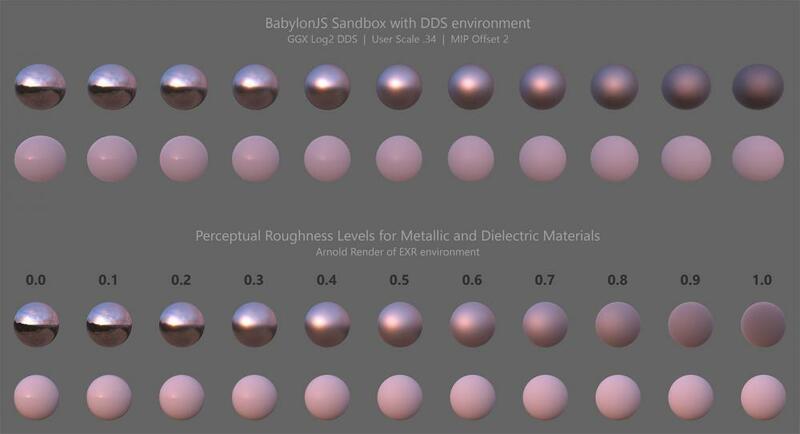 Looking at materials that are partially metallic and partially rough are confusing to the eye to determine what looks right, so simplifying it to the extremes for metallic allows us to concentrate only on roughness and values to ensure things look right. @Sebavan Thank you for teaching me a link to a wonderful thread. Since I do not have enough knowledge about PBR, I would like to study. I am also interested in PBR results in other applications, so I would like to investigate if possible. Blender, Unity, Unreal, Mixed Reality Viewer, Paint 3D, Windows 10 Explorer Preview, etc. @PatrickRyan I am deeply moved by your wonderful work. I understood that the rendering of Babylon.js has about the same capability as a commercial rendering engine. I'm glad that you prepared sample code as well. I do not have much knowledge about IBL, so I'd like to try various things and study. Hi, Thank you for your kind response to my friend @cx20. I'm impressed that Babylon.js is doing a lot of efforts to verify the reflection model. 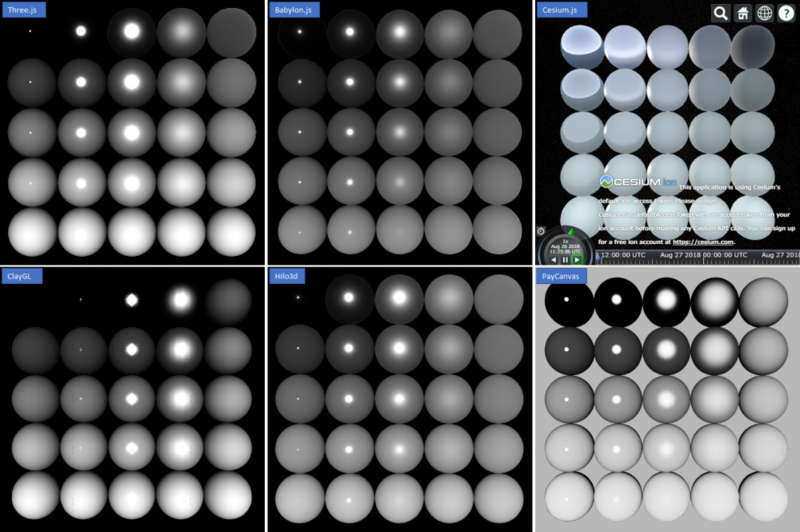 Recently, I started to add support of PBR to my library (still only punctual light). Let's say that Cook-Torrance base is good for the model of specular reflection. I was worried about which specific approximation formula is appropriate (Disney, Unreal Engine, Frostbite, Major companies, each best practice exists). Of course, I was also concerned about the handling of roughness etc. I immediately looked at the Khronos official PBR sample, and I decided to make the implementation almost the same for the time being. I wanted to avoid the result of my library getting away from other libraries, so I expected each library to reference it as a reference. But, according to cx20's comparison test (He is comparison test happy! ), The results of each library seem to be very different. And, in actual use of glTF 2.0, differences in PBR results which can be seen even at amateur level among each library seems to cause people a lot of confusion. For the general public, there are no interests in internal mathematics, and the brightness and color taste of what they saw are all. I think there are some key points of view. Even with local reflections, the results differ so much, so in the future, gIobal Illumination results will be more different between each library. Yup this is one of the main reason behind the creation of the both gltf extensions for lighting (punctual and ibl).